Understanding google moon’s surface anomaly network. Libration: An apparent or real oscillation of the moon, by which often not visible parts near the edge of the disc come into view. Satellite: An artificial body placed in orbit around the earth or another planet in order to collect information or for communication. Delta (Symbol): Variation of a variable or function. Are they real; what are they? Is this a network..? with ‘Line of Sight’ 600,000+ meters long. Are they linked to phase libration of the Moon & Sun?.. and Earth? There is one example of the complete opposite and inverted delta, which I call a dimple. 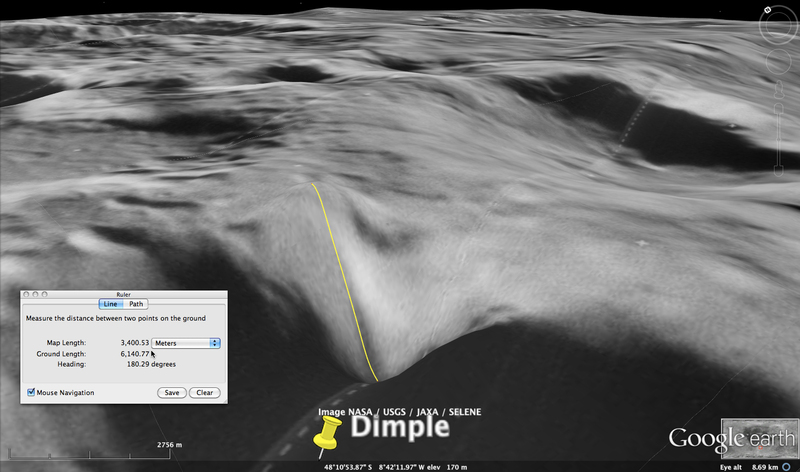 This detrusion delves about 9000 feet deep near the Tycho crater. It’s amazing to see how they have been camouflaged to blend in, with a surface environment that does not match with their size, form or shapes. It is very easy to miss these deltas, and you must skim towards the horizon to be able to see how they stick out above the surface. 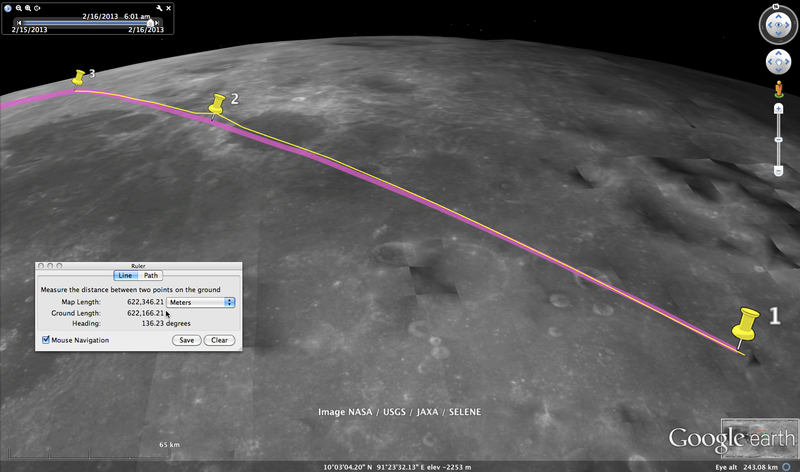 I applaud google for informing the public [in a subtle way] of a presence on the lunar surface. Regardless of the fact that we [as human individuals] have no way of actually observing, with our own eyes, the physical reality that sits only 238,900 miles (384,400 km) away from us on Planet Earth. In an informal way humans have been given the ability to travel and observe, while being in the comfort* of our own home(s). I prefer using the word ‘delta’ to describe them, rather than: pyramids, spikes, spires, steaples, teeth, towers, etc. Please examine and measure every distance and surface.. so to gain a truly accurate perspective. You now know their locations [some facing down on the Earth every night or day] go get your telescopes!!! The closeup videography of the moon is a sample clip by John Lenard Walson. Three Google Earth Moon anomalies discovered. I found 3 moon pyramids or as I call them steeples since they aspire to such amazing heights on the dark side of the Moon. These, perhaps ancient lunar pyramids are in an almost North South path 389 miles long and tower over 1300 meters. My thanks to Google Earth & Moon.. and hopefully Mars too, for allowing us to see what really did show up on the NASA Lunar Reconnaissance Orbiter and JAXA KAGUYA scans of our Moon’s surface. Four Google Earth Moon spikes confirmed. Now confirming 4 spikes protruding upward like stalagmite towers on the dark side of the moon. This one measures nearly 2000 meters tall and is now the 3rd tallest of this dark side group of 4. The smallest of them (Spike 1 is over 1300 meters tall) compared to the Empire State Building which only rises 443 meters above the Earth’s surface. My best guess is that google can’t hide the scans (at least the height measurements) from the interweb geeks, but it can perhaps put a drop cloth over top so as to not know exactly what these curious formations/structures are. Perhaps one day the apocalypse shall be lifted at the ladyhawk shall fly free. Seven Google Earth Moon teeth browsed. 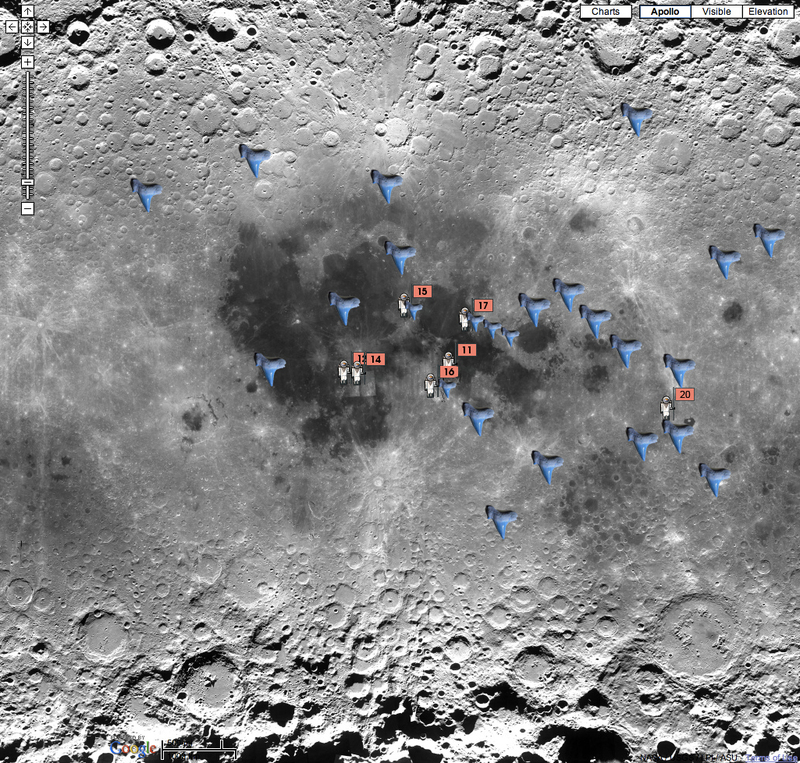 7 spikey shark tooth towers, some rising over 2000 meters on the lunar surface, spotted using google moon. I did notice there is some type of grid system for several of them in the Moon’s northern hemisphere on the dark side. Surprisingly enough there is one relatively viewable on the moon’s Earth-facing side that looks to be inline with some type of structure, that from above looks like the torso of a humanoid being.. and the spike seems to denote the head of that artistic body representation just as an outcropping of rocks on the mare floor. Reeferman420NL who found the underwater spires in the Pacific Ocean and Arken who posted the Mars ‘Devil tower’ on Above Top Secret. There may well be more spikes, or teeth, or hell even towers that have yet to be found.. Good luck and happy hunting!! 9 google moon bumps or just schweine lumps ? Nine Google Earth Moon bumps defined. 9 or more bumps can be found all over the google moon ..go look for more! I would not be surprised if there were more to find; it’s not that difficult to look for them. You need to skim the surface at about 30km and you’ll see them poking up above the horizon. So stop often, rotate and scan. But, most of all, don’t forget which direction you were traveling in the first place so you don’t go over your own tracks. When you are Pigs in Space, look out for sinister spaceships from the Crab Nebulae. Numerous giant symmetrical forms dispel coincidence. Still I search the moon and probe new protruding protuberances poking out of the pock-marked surface. Once you begin to understand and recognize the size and scale of these lunar anomalies, it becomes difficult to reconcile any sort of hand that might have been responsible for creation.. similar to the great pyramids of the Earth. What is the antonym of delta? Ok, this is different than anything I’ve seen yet on the moon. This deep depression near the Tycho crater delves over 3200 meters and holds striking, contrasting reflections of sunlight depending on the phase. Apollo Seventeen camera never panned South. Don’t you think it’s odd that Cernan and Schmitt never explored just to the south of their landing site? Surely they would have seen such a stunning form as their lander descended to the surface at such a slow pace. As well, Evans couldn’t have observed it in the Orbiter? Delta 14 is about 100 meters or roughly 300 feet tall. The audio from Apollo 17 has been edited. Apollo Fifteen missed Hadley’s best peak. They landed next to an awesome rille to explore for rocks, but far from a peak high in the Hadley Mountains. It would be quite impossible for Scott and Irwin to trek from the lander site all the way to the peak in the mountains. It’s a shame that Worden in the orbiter never spoke of this rock peaking out of the dusty mountaintop plateau. Delta 15 is about 100 meters or roughly 300 feet tall. The audio from Apollo 15 has been edited. Sweet Apollo Sixteen nears delta cluster. About 70km NorthEast from the landing site there is a cluster formation of deltas hidden in the shadows of the mountain crater basin. In a geometrical manner 2 deltas close to each other form a triangle with a 3rd delta 12km away. Then roughly 36km east is another delta hiding in its own camouflage on the other [more jagged] side of the mountain crater basin. Center Delta 1 is about 600 meters. Center Delta 2 is about 400 meters. mini delta 3 is about 200 meters. The audio from Apollo 16 has been edited. Does a dark side network exist? If there are deltas on the dark side of the moon then these would have to be it. They do stand out against the local geological environment. Mars deltas exist in two locations. Some people may already be aware of the tower near Terby Crater on the southern hemisphere, but there is another. Halfway around Mars North of the Valles Marineris is a delta protruding out of the wall of a fantastic canyon at Kasei Valles. The song is Sprawl .. by Ben Lee. hi!,I love your writing so so much! percentage we keep up a correspondence extra about your article on AOL? I require an expert on this space to unravel my problem. Maybe that’s you! Looking forward to look you.